Tax 2290 enables efficient e file tax return for federal heavy vehicle use tax form 2290 using sophisticated applications. Tax 2290 is rated as #1 by federal tax payers for e file highway vehicle Tax Form2290. Tax 2290 caters to various user profiles like Tax practitioners, Fleet operators, and Fleet owners who need to e file highway vehicle. Let us now go ahead and see the special features of our Tax Excise which has made it a leader in its domain. Tax preparation help for federal tax payers to modify the recent changes in federal heavy vehicle use tax form by Import Previous tax returns data facility. Display of taxpayers federal tax refund at every step of online e-filing by Tax Meter facility. 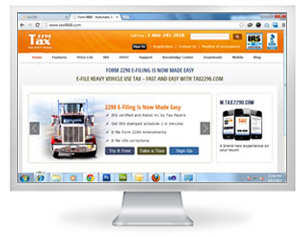 With our tax software, both tax practitioners and fleet owners can e file internal revenue service Form 2290. Save time and energy using bulk upload option. Form 2290 – What’s New? IRS electronic filing is required for each return tax reporting 25 or more vehicles that the taxpayer files during the tax period. However, all taxpayers are encouraged to perform IRS electronic filing. File federal heavy vehicle use tax form 2290 electronically through any electronic return originator (ERO), transmitter, and/or intermediate service provider (ISP) participating in the IRS e-file program for excise taxes. Taxpayers can now check boxes on page 1 of heavy vehicle use tax form 2290 to indicate if the return tax is amended or if a Vehicle Identification Number (VIN) is being corrected. Toll free customer support at 1-866-245-3918.